If picturesque views of the Atlantic Ocean and easy access to the beach right outside your back door are what you seek, it’s time to secure your stay at Seawalk 3. 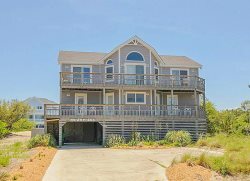 Conveniently located in the heart of Kill Devil Hills, this oceanfront townhome offers everything you need to make your next Outer Banks vacation the best one yet. Perfect for couples or a small family, this spaciousvacation rental home boasts three bedrooms and a large living and dining areawhere you can relax after a day at the beach while still taking in the sightsand sounds of the sea. Step out onto the top-floor oceanfront deck to watch anout-of-the-world sunrise without having the leave your house, or take a seat inan Adirondack chair to lose yourself in your favorite beach read while you soakup the sun and enjoy a gentle ocean breeze. Keep your eyes peeled for dolphinssplashing in the surf! Had enough sun for the day? Head down to the covered middle-level deck, which features plenty of seating for everyone in your party. Here you can gather around the table for a delicious meal made with fresh, local seafood, or simply sip a cocktail and enjoy a game night with family and friends—all while still enjoying views of the waves rolling just beyond the sand dunes. If you’re searching for a way to switch up your beach day, head to the community pool, which is located within steps of Seawalk 3 and provides the perfect place to take a dip when you’ve had enough beach time for the day. A fully stocked kitchen offers everything you need to cook your meals right here at home, but Seawalk 3 is also situated within minutes from some of the best restaurants on the entire Outer Banks. The Kill Devil Grill—a favorite among locals—is just one block away, and Mama Kwan’s Tiki Bar & Grill—which offers the best fish tacos on the beach—is just a half a mile from your vacation home. A trip to the Outer Banks isn’t complete without a visit to the Wright Brothers National Memorial, which commemorates the spot where brothers Wilbur and Orville Wright made history with the first powered flight in 1903. This iconic Outer Banks landmark is less than three miles from Seawalk 3 and features panoramic views of the Atlantic Ocean and Roanoke Sound from the top of the hill on which the monument is located. With its prime location in central Kill Devil Hills,incredible views of the ocean, and direct and easy access to one of the bestbeaches on the Outer Banks, this beautiful and well-appointed townhome is theperfect spot for you to spend your next beach vacation. Book your stay at Seawalk3 today and let the countdown to soaking up the sun, surf and sand begin! Need more than one unit? Additional Seaside Vacations homes in the same complex: SW5, SW6, SW7, SW11, SW17, and SW18. Bedding: 2 Queens; 2 Twins. 2019 Pool Dates (weather permitting): May 18th - October 6th.